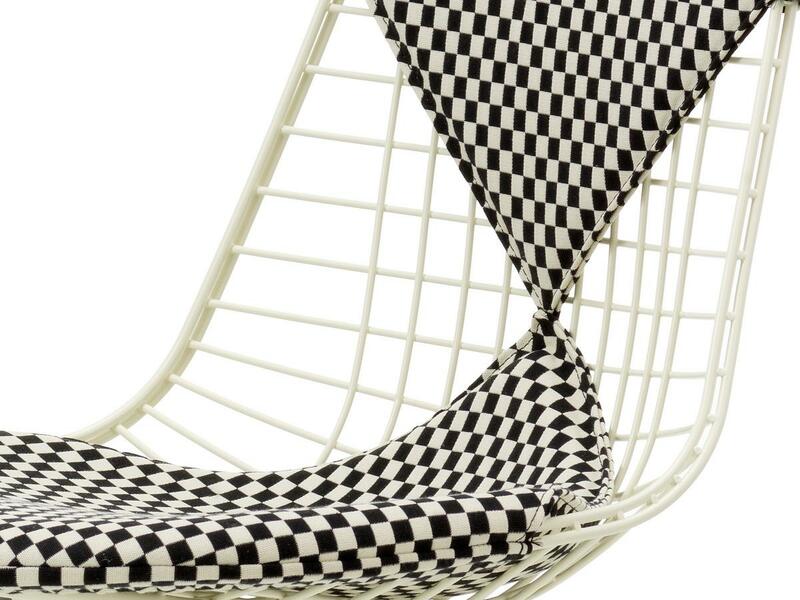 With their 1951 Wire Chair, Ray and Charles Eames took up the shape of the one-piece shell of the Plastic Chairs and realized a construction of welded steel wire. Even though the shape is essentially the same, the Eames Wire Chairs have a completely different appearance. The grid structure and the gloss of the chrome-plated steel wire give the Vitra Wire Chairs a particularly casual look; one which is perfectly off-set on combination with the legendary bikini cover. The Eames Wire Chairs include the DKR Wire Chair with characteristic Eiffel Tower underframe, the DKX Wire Chair with four-leg base made of tubular steel, the DKW Wire Chairs with braced wooden legs, and the DKR Wire Chair Outdoor for outdoor use. The DKR Checker's bikini cover resembles a chessboard pattern.